This blog could lower your interest! It's almost guaranteed! Advertising is a really big word, and it keeps growing all the time. It contains mediums, philosophies and specialties that are expanding and changing at a mind-numbing speed. What method or tactic you take depends on the medium, market, budget and brand. The message shouldn't be the same across the board. Direct mail, for example, needs to get the recipient's attention, interest and trust immediately in order for them to open, read, then act on it. A billboard needs gain the driver's attention and be memorable enough for them to act on it later, but it has only a few seconds, a visual and seven words or less to accomplish this with. An ad in a coupon section of the newspaper needs to visually "pop" out of all that noise as well as contain a perceived savings enough to get the reader to act on it. The list goes on, and while the strategies vary for the different forms of advertising, they all need to be honest. Truth in advertising might sound like an oxymoron, but for the most part, it's the law. Did you notice that I said "perceived savings" about the ad in the coupon section? Just because something is true doesn't mean it's not slanted in its view. Different people have different points of view, different ideas of value. With behavioral marketing exploding the way it is, different people are actually seeing different ads when they go to the same places – ads with their needs and interests in mind. I'm a big fan of it, from both the perspective of the consumer and the advertiser. 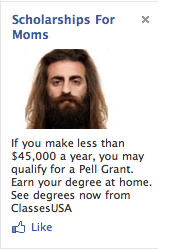 What I don't get is what's going on with some of the Facebook ads. Can someone please explain the strategy to me that prompted this photograph to be in this ad? 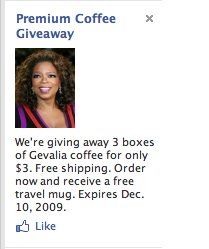 What does she have to do with this coffee? Is she endorsing it? My bet is no. Who's going to call the ad police about that one? I just pass it by with the rest, thinking that the internet really still is the wild, wild west. Still a lot of law and order to come, which will probably both help and restrict us. In the meantime, each to their own ethics, and the prospecting opportunity is spectacular.